Melts better and 45% less fat than cheddar cheese! Per 1/4 Inch Slice: 70 calories; 2.5 g sat fat (13% DV); 400 mg sodium (17% DV); 2 g sugars. See nutrition information for saturated fat and sodium content. 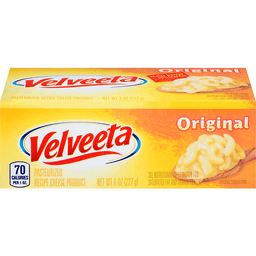 Velveeta contains 4 g fat per serving; Cheddar cheese contains 9 g fat per serving. 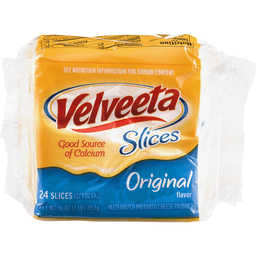 Visit us at: Velveeta.com. 1-800-634-1984. Please have package available. 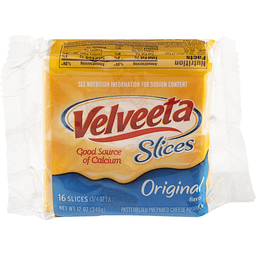 Try Velveeta Sharp Cheddar and Queso Blanco. Facebook: Like us on Facebook! Melts better and 60% less fat than cheddar cheese! Per 1/4 Inch Slice: 60 calories; 1.5 g sat fat (8% DV); 390 mg sodium (16% DV); 3 g sugars. 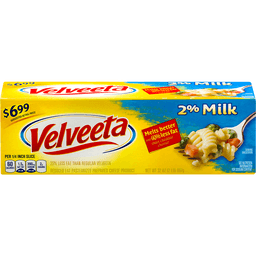 25% less fat than regular Velveeta. See nutrition information for sodium content. 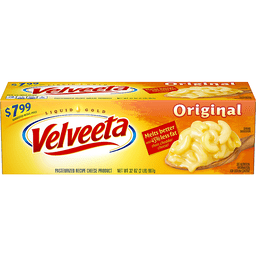 Facts per Serving: This Product: 3 g fat; Regular Velveeta: 4 g fat; Cheddar Cheese: 9 g fat. 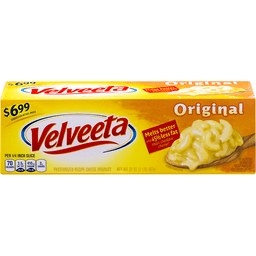 Visit us at: velveeta.com. 1-800-634-1984 please have package available. Visit us on Velveeta.com and Facebook!